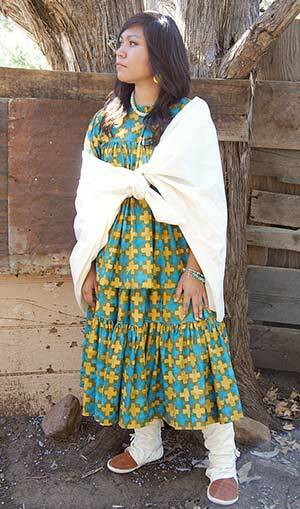 Female Native American fashion designers from the San Carlos Apache Reservation are joining together to present "Walking in Her Steps: Honoring the Women Who Inspire," a fashion show showcasing their unique designs. "The name comes from my desire to honor women I have read about, heard about and live to be like," said fashion designer and coordinator Selina Curley, adding that a few of the women she looks to honor are Diné Annie Dodge Wauneka, two Apache warrior women known as Lozen and Dahteste, but most of all her mother Cecelia Lewis-Curley, Apache. "She taught me the art of dressmaking and gave me an appreciation and love for design and clothing," Curley said. Curley said she read a book about Wauneka, and that brought up a memory of when she was a little girl and her father Isaac Curley took the family to visit her. "He called her our aunt, and as young as I was I remember her. She was strong, intelligent, a female in a world of politics and a male-dominated work place. 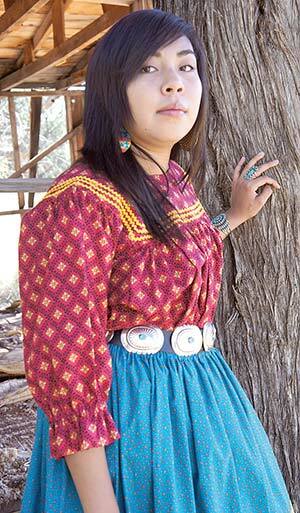 She stood on her own and brought much help and awareness of the Navajo to many," Curley said. Curley describes Lozen and Dahteste as "courageous, spiritual as well as spirited, they fought for freedom alongside the likes of Geronimo and Cochise." Curley started her company, "Traditions by Selina" in 1984, a year after she moved to the reservation from Superior, Ariz., but her love for fashion design started when she was a teenager thanks to her mother. Now, with over 20 years of fashion design under her belt, Curley's recent achievements include being named one of 14 rising fashion designers in Native People magazine last year. "I find inspiration in everything and everyone," Curley said, adding that "one must keep their heart, soul and eyes open to find beauty and inspiration to create whatever they are gifted in." Curley added, "It is my belief that every good gift comes from our Creator and one must keep that connection to make life blessed and to be a blessing. "All beauty comes to us if we honor our Creator, our culture, our history. It is how I live and it is the only way I know to create my clothing," Curley added. Curley is originally from Superior, Ariz., but has lived on the San Carlos Apache Reservation since 1983. She is Butterfly Clan, born for the Tsénjíkiní. The fashion show will also feature two local female designers, Samantha Hunter who will showcase her bead and handbag designs, and Skyler Polk, owner and creator of Rise and Assert, a T-shirt company. "Both are of Apache descent and it is my pleasure to share the stage with them. I believe we should always encourage young artists and give them all the support we can," Curley said. 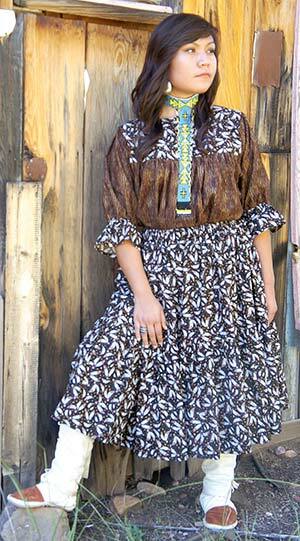 Curley will be featuring contemporary and traditional Apache/Navajo clothing by showcasing at least 20 dresses. Hunter has been beading for the past 13 years, but much of her work has been on commission and this didn't leave much time for her to actually showcase her pieces. "I never have the chance to really showcase things I can do so I'm looking forward to this opportunity," Hunter said, adding that her beadwork is seen in tribal royalty crowns. Currently Miss San Carlos, Miss White Mountain Apache, Miss Fort McDowell and Miss Yavapai Apache wear crowns she has beaded. But beside Hunter's well-known beadwork she will be showcasing her love for sewing by showing off two appliqué tote bags. "I have been sewing for about 11 years and I mostly sew for myself or family," Hunter said, adding that she has been only making bags for the past five years, and in that time her bags have been featured on "Buckskin Boutique." "I'm known for my beading but I don't think many people know my sewing," Hunter said before admitting she is nervous that trying something different will not turn out as she expects. The "Walking in Her Steps: Honoring the Women Who Inspire" fashion show will be this Saturday, Nov. 2 starting at 6 p.m. at the Apache Gold Convention Center. The event will include a raffle drawing during the event and fashion presented during the event will be available for purchase after the show. Tickets are $20 for VIP or $10 general admission. Information: 928-475-5936 or 928-475-5326. Contact Shondiin Silversmith at ssilversmith@navajotimes.com or 928-871-1138.